Update 6/3/2014: Wow! One year later exactly! Guess what? Tagul updated from Flash to HTML5. Although this is great news for Tagul users, it is terrible news for wordpress.com users. Wordpress.com does not support HTML5 to date. It looks like this method may no longer work as written. I'll keep my eye out for a new method. My suggestion... move from wordpress.com! ;) Let me know if anyone finds a creative way to make this till work. Are you like me and get frustrated with some of the code limitations of a WordPress.com hosted site? Sometimes I feel like I have this brilliant idea and then it comes to a screeching halt. When I run head first into these invisible walls that are WordPress.com's limitations, I can't help but think, "Gosh... I wish I had chosen self-hosted instead!" Firstly, I did not figure this out on my own. I have some experience with html and building websites. When diving into WordPress's limitations and thinking about how to find a loophole, I first looked at what they do allow and started Googling to find my answer. WordPress.com hosted sites are allowed to embed flash through use of the Gigya shortcode. What the heck is Gigya? Well, I didn't know anything about Gigya either, but I had found some sites (like WordPress tips) talking about embedding flash videos. I had found Gigya while researching how to insert Picasa Slide Shows, which are also flash codes. (I'll post how to do this at a later time.) Gigya is simply a shorter version of code to embed Flash code (like videos and slide shows). Well, I wasn't going to let that stop me. My next jump in logic was to determine if I can embed iframes in WordPress.com. What's an iframe? An iframe is simply an embedded website. If you have two independent websites, with iframes you can actually embed the first website into the second site. Think of it like a picture frame hanging on a wall. The first site is within the frame, while the second site is outside of the frame. Caphiche? So could I embed another page into a WordPress post? The short answer was NO again. HOWEVER, this is how I found Netty Gritty's How to Embed iframe Widgets in a WordPress.com Blog. This tutorial goes over how to convert iframe widgets to flash using a third party app intended for a completely different purpose. Then you can use the Gigya code to embed the flash code into a WordPress.com blog post. Unfortunately, Netty Gritty's site is no longer maintained, so I was unable to thank them. I know, this sounds like a really long process, but it is actually pretty simple once you dive into it. 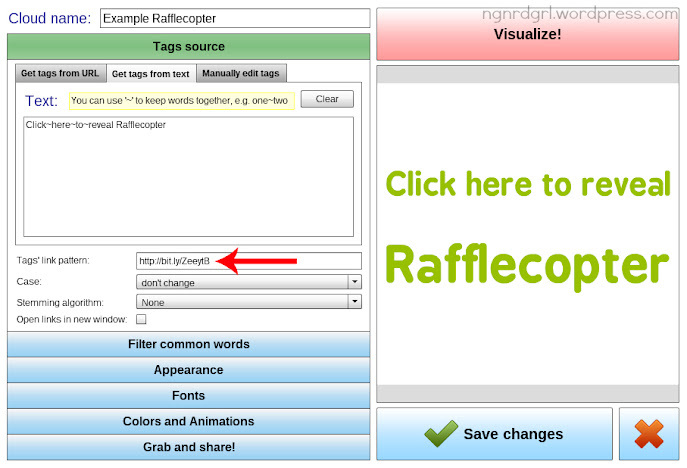 What I found along the way is that Rafflecopter is in fact an iframe widget, so I was able to simplify my original plan. 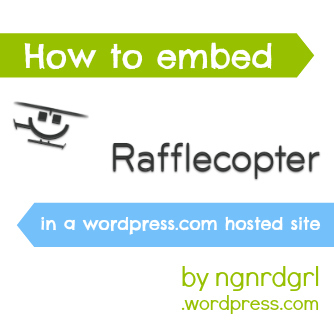 Here are the steps I used to embed the Rafflecopter into my post. In this tutorial we are going to break the Rafflecopter widget down into an iframe widget, then convert the iframe widget to a flash widget by using Netty Gritty's How to Embed iframe Widgets in a WordPress.com Blog tutorial. 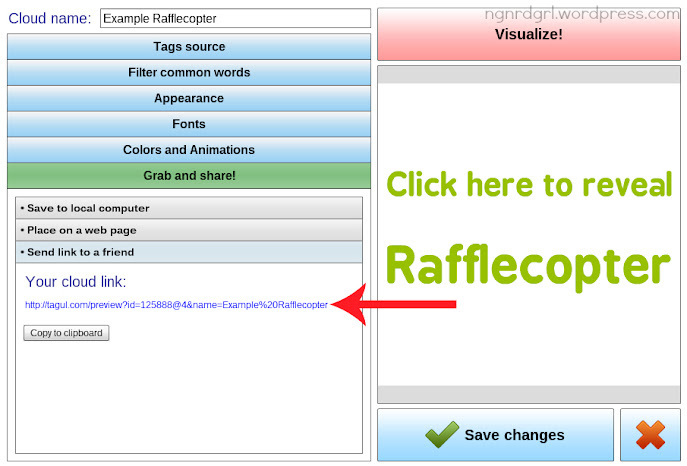 Go through the steps to make your Rafflecopter widget. If you have never used Rafflecopter before, here is a Rafflecopter Tutorial by Tutus & Teaparties. When you get to the point where you are ready to embed the widget, stop and proceed with the next step below. 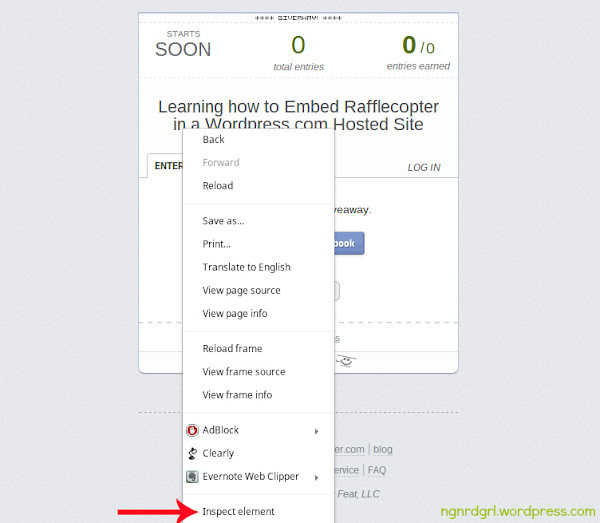 Step 1) On the "Embed' tab, copy the widget code to your clipboard. 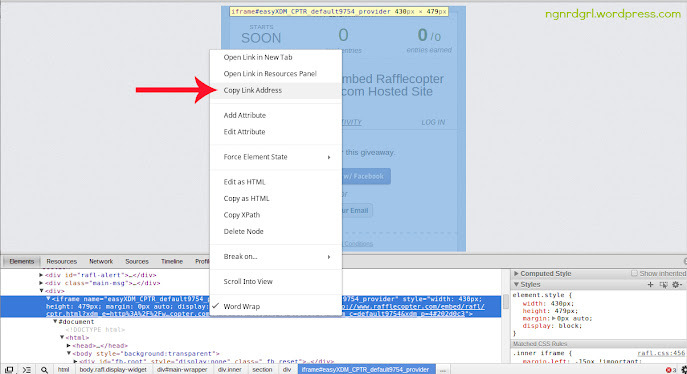 Step 2) Open a new tab/window and paste your code into your browser navigation bar, but don't hit enter. I am using Google Chrome Browser, so this will look different in Firefox, Explorer, Safari, etc. OR it may not even be possible in another browser. I don't know other browsers, so don't even ask me how to do this step in another browser. To make this easier, just use Chrome (it is a superior browser anyways!). Step 2) And select "Inspect Element." Again, this is going to be different in other browsers or you may not even be able to use this function. Step 4) Copy the source address. You should be able to right-click on the address source and say "Copy Link Address" as above. You want the http:// address that is within the iframe brakets. See how it stripped out all the extraneous information and now JUST shows your widget? This is how you want it to look when it is embedded into your post. Use bitly or a similar site to shrink down the Rafflecopter source address that you just copied. This tutorial WILL NOT WORK unless you do this step. 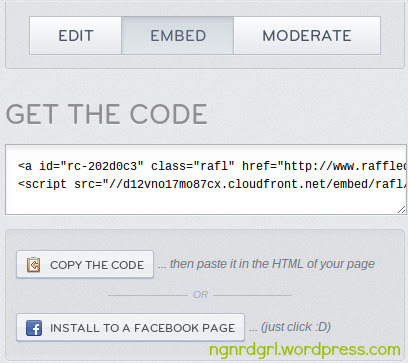 This is the step where we start following Netty Gritty's How to Embed iframe Widgets in a WordPress.com Blog tutorial. Netty's tutorial goes over more of the steps on setting up the Tagul tag cloud. Click the clear button to remove the example text. Write what the widget will initially say in the first text box. I wrote "Click~here~to~reveal Rafflecopter." You can use ~ between words to keep the words together as a single tag. For instance, I wrote "Click~here~to~reveal" in order to keep these words together. If I didn't, it would have randomized the order of these words and it would not make sense. You want to put your bitly shortened url for the "Tag's link pattern" (red arrow is pointing to it above). Click Visualize to see what the text will look like. You can adjust fonts, colors and shape of the cloud tag with the other sections of the widget creator. Once you are satisfied, click the "Save Changes" button. Netty's tutorial walks through these steps in more detail. All you are looking for is the number@number. This is the code you want to copy and paste into your WordPress.com hosted post. You can adjust the width and height with the values you want the widget to be. I used a width of 500 and height of 575. I like to also center the code so that the widget is centered in my post. See below example to see how it looks with this setting. You can put this code directly into the "visual" tab of your post editor. No need to even switch to "text" and mess with html code. The Gigya code will not display anything in the visual editor, so click the preview button to see it work. Want to see it in action? Since I moved to Blogspot, the gigya code is no longer supported. Click over to my WordPress test page to see it in action. Click here to check out the Rafflecopter in action!!! Unfortunately, it isn't a perfect embed. Your participants have to click on the text to reveal the iframe widget. It is better than nothing at all or having them click a link to another page. Wow! Thanks for the tutorial! I am such a dummy when it comes to code-- lots to learn! Just what I needed! Thanks for the 'holding my hand' approach that I could understand. I am not a techie by any means, so I am very grateful to you! I know how frustrating the limitations of Wordpress.com can be...but seriously, girl, you are working wonders in spite of it and really making your site your own. I love it! Thanks for sharing your knowledge with us! I've never seen a post like this before, so I know there's a need for this information in blogland. You go, girl. Thanks, Christine! I hope it helps. Let me know if you try it and feel free to contact me if you ever need help with it. Thank you, Lauren! I'm glad I got a chuckle from you. That was the real point of the post. ;) I find it kind of fun learning how to get what I want done. It's like a puzzle. I hope people find it useful. I known I was disappointed when I first realized I couldn't use rafflecopter. I wanted to be part of the cool kids. Thanks, partner, that's mighty nice of you. (Sorry for the corny answer.) In all seriousness, I appreciate you sharing your technological knowledge. I hear ya, girl...especially on the "cool kids" part. When you see everyone else taking advantage of fun features, it's hard to sit back and watch without jumping in! 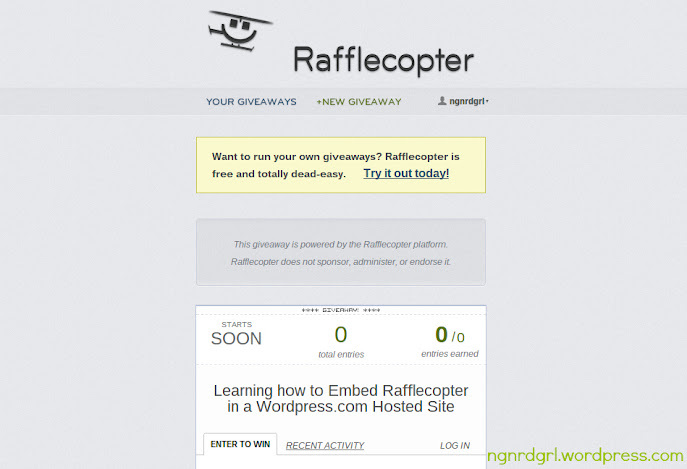 Way to make it possible for wordpress.com-ers to jump in on the rafflecopter action! Great tutorial! 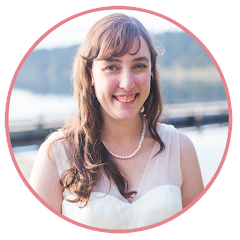 I'm on a self-hosted WP site, but I pinned this anyways because everyone should see it! Where in the code do I place my number @ number? Sorry about that. Wordpress.com ate my code. It is now back. At step three, where it tells you to input your number@number into the code, it should have a "[gigya src ..." code in a text box. Let me know if that works (or doesn't) for you! I've put it into the visual section as well as the text, but no dice. ?? Any ideas what I can do? Have you tried clicking the preview button? The gigya code will not show up in the visual section (I should have mentioned that in the tutorial), but they will when you click preview. Let me know if that works or doesn't. Ok I am so close to getting this right!! I got my code which is 155413@1 but I have no idea where to input it on the iframe code your provided. Please help! Thank you SOOOO much. I'm participating in a mass giveaway with other bloggers and I really really needed to be able to put rafflecopter on my blog and I always had to link back to facebook in order to do so. I got it to work! You're awesome!! yes, I definitely have. I even attempted to temporarily post it live to see if it would work, but it isn't...?? Once you fill it out, you need to click the "visualize" button, then save it. OMG! At first, I was like, "there's no way I can do this," but I DID!!! Thank you for posting this information. The fonts you selected are not able to render the tags. Please choose another fonts using the language filter. The font I really want is Gunplay Regular, but it's not working with *any* font I select! sometimes hunting to problem solve is fun, but...golly this one was a LOT! I totally understand. I was so frustrated, I decided to move the blog to blogger. I've blogged about the move. If you are interested, start with Why I Moved from WordPress.com to Blogspot.com. OMG.... thank you sooooooooooooooooooooooooooooooooooooooooo much for this! Yay!!! I am so glad it worked for you! I actually did end up leaving WordPress.com. I got invited to host a link party, but you can't on WordPress. I wrote about the whole process: Why I moved from WordPress.com to Blogspot.com and How I moved from WordPress.com to Blogspot.com. And love the heart shape you did for your reveal text. <3! Thank you so much!!! I am hosting my first giveaway and really wanted to use rafflecopter and it was stressing me out! This was perfect! Ugh. I don't know what i did wrong but when i preview it, its not coming up with my words? it says N/A? Mine says 'N/A' as well! How do I fix it? Thanks! I went over your steps again and tried it one more time! It works perfectly! I've been looking for a method for 2 months now and I've finally found it here! Thank you so much! These instructions are amazing. I was helping a friend who uses the free wordpress.com, and I was a little intimidated when I saw all the steps, but I carefully followed each one and did not have any problems! You explained it all so clearly! Before I found your post, we thought she might have to drop out of the giveaway, but your workaround made it possible for her to stay in. Thank you! Everything was working great and get get step 4 to work. There isnt a copy link address option onlu copy html or copy xpath. any suggestions? I am on a mac. Hi Allison! Sorry for the late response. What browser are you using? I am on mac too, but I am using Chrome browser. Make sure to right click on the actual url. I get "Copy html" or "copy xpath" also, but the second from the top of the list is "copy link address." If it still doesn't show up, try copying the html. You might have to delete code around the url address, but it should work. You could paste the html code into a word document so you can find the url to copy and paste. Let me know if it does or doesn't work. Good luck! Oh my gosh, this is a life saver! I find myself getting more and more frustrated with wordpress. Maybe a google account for my blog is on in the future. Hi there ... I was investigating this workaround. However, it seems Tagul is no longer supporting the http://cdn.tagul.com/cloud.swf. It just gives a big N/A and when you click it it goes to the main site. I was wondering if you had discovered another workaround? It looks like Tagul updated from Flash to HTML5. Although this is great for Tagul, it may have made this workaround obsolete. I am researching if anyone has a creative idea for embedding HTML5 on a wordpress.com site or if there is some other gigya code for HTML5. I'll post an update if I find anything. Let me know if you guys see anything out there that might be promising.